Gov. Haley is urging more people to evacuate the coast. In a 9:30 a.m. press conference Thursday, Gov. 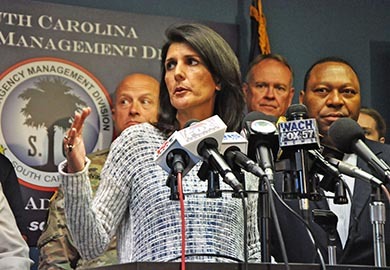 Nikki Haley stated only 175,000 people have evacuated the South Carolina coast. She, along with other officials manning Hurricane Matthew preparations, urged more people to evacuate as many gas stations, pharmacies, and other businesses are planning to close within the next day. Thursday’s evacuations will take place from the Pee Dee to the Low Country. As of Thursday morning, 38 shelters are open, two of which are pet-friendly, and 50 more are on standby. There are currently 677 people residing in shelters around the state. Those heading to shelters are encouraged to take comfort items such as blankets and pillows with them, as well as special foods, prescriptions, and baby formula. DHEC is also transporting 150 nursing home patients to safety. According to Gov. Haley, most hotels in the Midlands area are full. She recommends evacuees try to make reservations at hotels in Charlotte. Visit http://www.scemd.org/ for the latest updates on evacuations and shelter openings.